The Fellowship was fortunate enough to obtain a copy of BLOODSTRIKE #27 from Image Comics. Tim Seeley writes, Francesco Caston draws and colors, and Crank! letters. Undead supers. Not just mindless zombies, thank goodness. But real super-powered people being brought back from the dead to keep fighting. Stone is a likable character, though I suspect not a very deep one. I don’t really think he needs to be, though. Dr. Rein strikes me as a more interesting long-term character study (though maybe that makes me weird). We’ll just have to see how that unfolds. 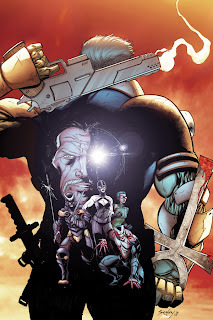 This looks like a well-established book (coming from Rob Liefeld that’s no surprise, of course) with some intrigue to go along with the action. I’m going to keep an eye on this one. BLOODSTRIKE #27 is available now at your FLCS or by order from imagecomics.com.